Python is a popular general purpose programming language which is well suited to a wide range of problems. 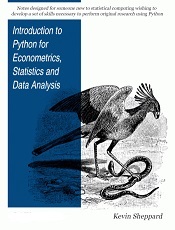 Recent developments have extended Python's range of applicability to econometrics, statistics and general numerical analysis. Python – with the right set of add-ons – is comparable to domain-specific languages such as R, MATLAB or Julia. This book provides an introduction to Python for a beginning programmer. They may also be useful for an experienced Python programmer interested in using NumPy, SciPy, and matplotlib for numerical and statistical analaysis. They should also be useful for students, researchers or practitioners who require a versatile platform for econometrics, statistics or general numerical analysis (e.g. numeric solutions to economic models or model simulation).